This is my favorite birthday card. It is not every day you get a handwritten card from the ever famous Towanda Yazcat. Yay! See you animals on the other side. Smooch! I cannot believe I could not find this Person of Interest clip on Youtube without foreign subtitles. What is wrong with Americans? This is the BEST DOG SCENE EVER! You have total IQ every time you visit or view or like a cute animal photo. You get more productive and smarter. Yay! Also possibly more Japanese but the Japanese have better hair and fashion across the board than anyone in the US anyway so that is not a con. Expect more cute animal photos soon. That is my contribution to society and science dammit! The owls spend time on this enormous tower by my apartment building. That tower is over four stories tall. I do not know what the purpose of that tower is. Sometimes mysterious workmen come out to work on things in electric panels at the tower’s base at night. That is always odd to me. Workmen at night. Like real night. 2 AM and 3 AM real night. I think that tower is the owls’ winter vacation residence. The owls were here when I moved in last year right at the end of November and were still here through December. Then the owls went away. It is November again and the owls are back. I wonder where their summer home is? Before tonight I had never seen one of the owls. I would hear them. They call out their “who” calls late at night after the sun is long gone and their call echoes for miles – or at least sounds like miles to me on my balcony hearing their calls echo out. Tonight I saw one of the owls. The owl was in silhouette, just a dark bird with a real long wing span coasting away against the night’s darkness. That is one seriously big owl. I spent some formative years in the country. I know a long wing span when I see one. This owl has a wing span bigger than any hawk – and I have seen some pretty big hawks – I have ever seen. Bigger than a falcon and I have seen some pretty big falcons too. That owl has vulture wingspan. Like the big vultures, the huge ones, that are bigger than eagles and when they spread their wings, their wing span is wider than I am tall. I have never seen an owl that big before. But there he is. With his partner. Wintering atop the four story mystery tower next to my building. He could so beat me arm wrestling. Maybe I better put on a little weight. I have this new roommate. The Gecko. He is small. He does not pay rent. I think he is couch surfing. The first time I saw the gecko I was very worried about the gecko. What if the gecko wandered under the couch and became confused and disoriented and dehydrated? A few days after the gecko moved in the gecko dodged onto the balcony when I opened the balcony door to go smoke. I encouraged the gecko to flee and be free. The gecko would have none of it. A day later there was the gecko and the gecko dodged back in. The gecko has been couch surfing here a month. It works out. The gecko dodges in and out when the gecko wants. The gecko never comes in the bedroom. I do not think the gecko likes carpeting. 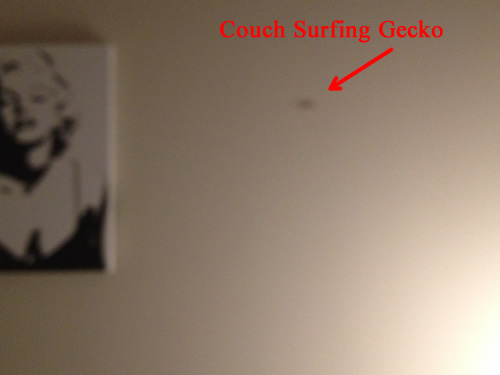 The gecko likes the office and the wall by Marilyn. 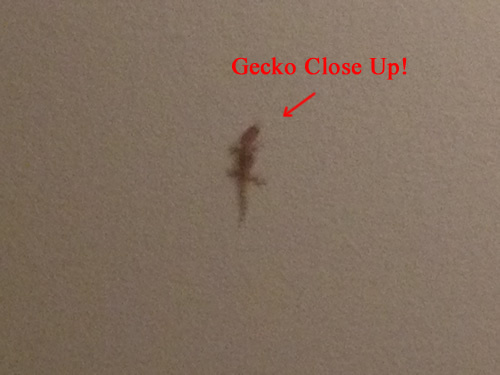 You totally want to see the gecko closeup don’t you? *Shut up, it’s an iPhone, what do you want, gecko leg stubble? I figure everyone getting stormed out in Texas and places other could use a laugh about now. Donna the Deer Lady is hilarious to me and just never gets old. There is a small green lizard on the balcony. For a while, the small green lizard was pretty good about just being still while I was out there. The lizard’s thing is making a run across my feet and staring at me hard from [whatever I guess is] a safe lizard position. I have no idea what kind of bravery is required to be a 1 ounce lizard attempting to stare down and intimidate a 100+ pound human for balcony privileges.